Topman has been providing high quality men’s styles since 1978, when it emerged as a brother of the much loved Topshop brand. Now its stores are in 60 cities worldwide and it’s making great inroads in Asia and America too. With over 40 Nordstrom stores housing the brand on top of this, there are few fashion hubs you can go to without encountering this retailer. As well as its excellent own brand menswear, you’ll find the cream of Calvin Klein, Tommy Hilfiger, Eastpak and many others on its shelves and over its pages. Topman’s outerwear has everything you need to layer up, from textured overcoats and sheepskin jackets to lighter denim and sports numbers. It’s got blazers and jackets to smarten up casual outfits, as well as tees and chinos to nail your casual look every time. Underwear is taken care of too, so you can get style throughout your look. You can shop by edit to make sure your basket is on trend or head to the sale to guarantee yourself a hefty discount. How do I use my Topman promotion code? Sign up to Topman’s mailing list on its homepage to hear about some brilliant offers! Can I get Topman gift cards? Where is my nearest Topman store? Can I get a student discount with Topman? You sure can, enter your details here and enjoy a 10% discount. You can return your purchase within 28 days of receipt to receive an exchange or refund. Item must be in original conditions and packaging. You can return items by post or in store (in which case you’ll have up to 30 days). Click here to generate a return label then send your product back. Full policy here. If you’re a fashion forward guy, Topman should be your go-to for what’s hot in menswear. It’s got a range of styles to suit any occasion, each finely designed and cut, all ripe for customising and wearing your own way. Add a Topman discount code to your order and you’re sure to make a saving, so whether you’re shopping for the office, the street or a night out, keep it Topman for great deals on quality gear. Topman’s blog, Style & Stuff, is well worth bookmarking to get you the fast track to the latest trends. With exclusive profiles of its newest lines and featured designers, as well as new season staples, it’s an easy way to get in the know about the shirts, jackets, patterns and materials setting the menswear scene alight. It’s also got interviews with exciting creatives from around the world, so you can see what’s inspiring them and get inspired yourself! Suit yourself with the on-trend men’s tailoring section that never misses a beat. You’ll find a range of fits from travel to skinny, all customisable from smart-casual to the utmost formality. 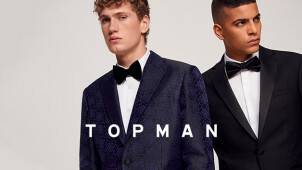 Get suited and booted with a Topman promo code and you could smarten up without losing a huge chunk of change, so keep it vouchercloud for the best deals on this top brand. Add a pair of smart shoes and some formal accessories to complete your look.